There’s nothing quite like making the most of the verdant embrace that is nature when you are hosting your next get-together or social event. Floral-inspired and tea-party-esque motifs create a unique botanical ambiance that is sure to impress your guests. Here are some great ideas on how to throw a nature-themed party. Floral styling is definitely trending and forms the perfect complement to a nature-themed event. You can easily dress up a high tea, birthday party, baby shower or, indeed – any kind of garden party you might possibly imagine in accordance with this oh so charming aesthetic. For the most floral inspiration check out this flower wall hire in Sydney. The silk hydrangeas from the perfect backdrop for your event, and it even comes with a photo booth – allowing you to capture images of your guest enjoying themselves at your fabulous soiree! Vintage vibes are where it’s at. And when it comes to this trend it’s so easy to DIY. It’s possible to source items like tablecloths, tea cups/sets, cake stands and other display/decorative items from your local op shop. This is an ideal option as you’ll be supporting charities into the bargain! Look out for items like vintage lace, this always looks lovely as bunting, for example, you can try pairing with table centerpieces of rosebuds and baby-breath. Alternatively, you can hire carefully curated vintage details. This takes all the legwork out of styling your event. From delicately detailed English china, through to elaborate silver candlestick holders, it’s all in creating that very desirable and specific ‘vintage look’. Calling in the experts in event planning can make it all a breeze. Perhaps try some handcrafted signage and soy candles to add that finishing flourish? You could even ‘pop-down the rabbit-hole’ with an Alice in Wonderland woodland theme. You might even ask your guests to dress up as their favourite character. You don’t have to go all out, a few moss bunnies, some decks of playing cards and a string or two of fairy lights can be enough to set the scene. There are so many options in entertainment when you are hosting a nature-themed gathering. Lawn games and pinatas are some top examples. You could encourage your guests to get in touch with their inner Picasso with a spot of painting lessons in the sunshine. With the addition of a ‘bit of a tipple’, this can really get the party started. In terms of food and drinks, there are some really simple yet effective ideas you might consider. How about frozen Prosecco grapes? Not only do they fit a garden setting so perfectly, but they also form a unique-point-of-interest and are so refreshing on the palette. Your guest will be talking about them for weeks to come! Another cute touch is to use flower stems as cocktail stirrers, bringing that botanical theme ‘next level’. Of course, there are those obligatory cucumber sandwiches, Hors d’oeuvre, and sweet treats to keep your guests satisfied during the course of your event. A garden party practically begs for the use of floral accents. 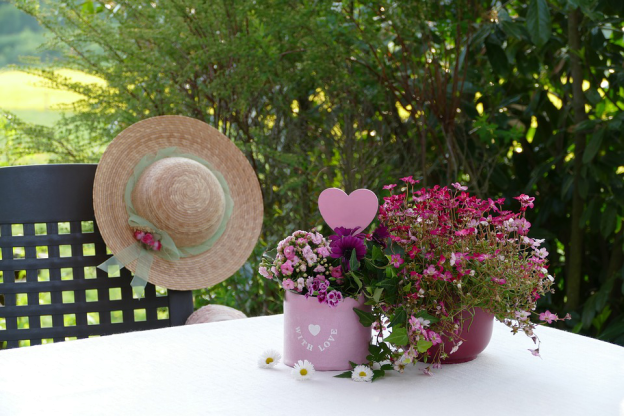 Whether ultra-feminine or even slightly edgy and artistic, there’s a way to dress up any garden gathering in this way. Nature provides a stellar canvas on which to build your next delightful social event We hope you enjoy your floral frivolities with aplomb!